She presumes it will take a couple of days to sort out just how she wants her new blog to look (and time she does have at the moment!). But the female Dawn Jogger decided that she really couldn’t start the new year being “gimpy and grumpy.” That moniker was coined in the summer of 2009 when she underwent Achilles heel surgery, from which she is now fully recovered. Like her previous blogs First Blush and Gimpy and Grumpy, most of the focus of Dawn Jogger 2011 will be on what she sees and hears in the early morning hours of her sunrise running routine. But there will also be a sprinkling of travels, which also usually includes a dawn jog. 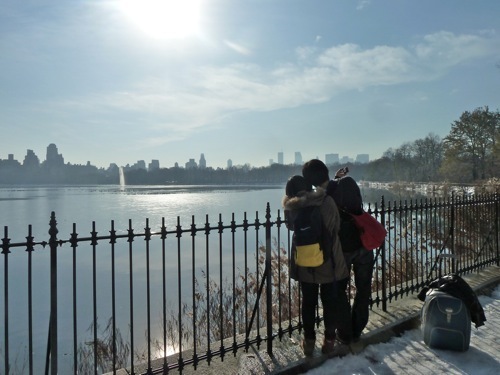 So at the beginning of 2011, she finds herself in snowy but very balmy New York City. The daytime temp of around 50 means that tons of locals and tourists are roaming about in almost shirt sleeves even though the snow is still two feet deep in most places. This entry was posted in Dawn jogging, On the road. Bookmark the permalink. Nice! You are sooooooo practical! Where’s the photo from? Dawn Jogger says it all, but I liked the old picture of you sprawling in your study, even tho you are no longer gimpy or grumpy. Enjoy New York! Brava! It is an honor to be part of your expressive life. Really enjoyed the images on G&G. All the best in 2011! I like your attitude! Glad your trip is going nicely and things have warmed up in NYC. Talk soon!